I wasn’t quite sure what to call these muffins! 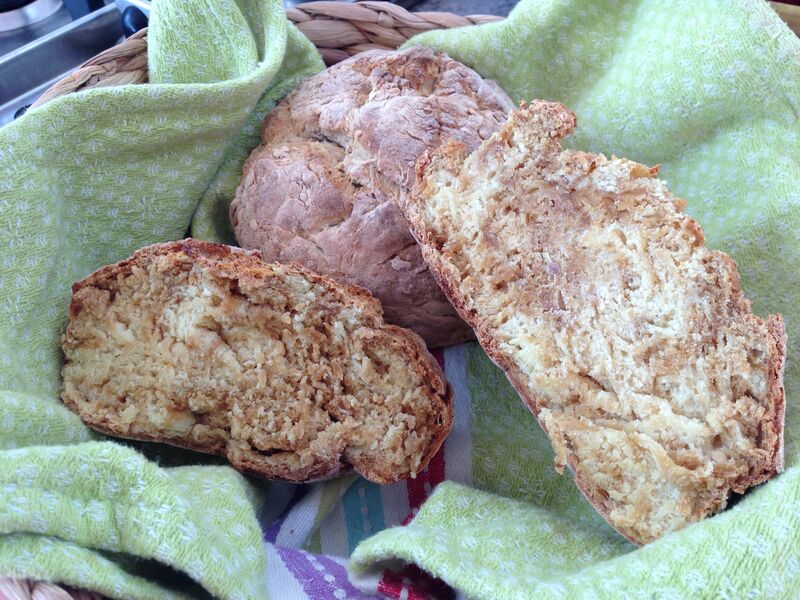 They are inspired by the recipe for Irish soda bread but, like all good muffins, are fruit filled and quite moist. 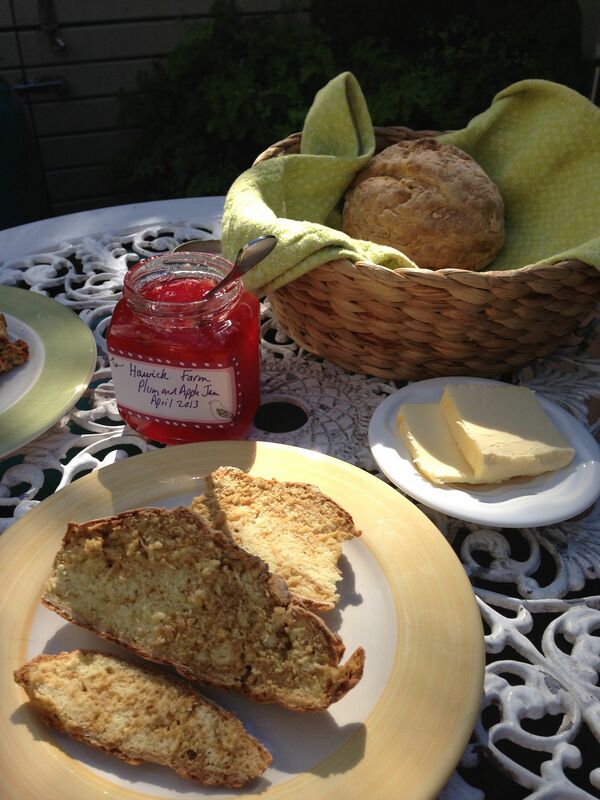 They came about when I was researching soda bread and found this great recipe from Jack Monroe for Rhubarb and Ginger Soda Bread from her blog Cooking on a Bootstrap. I was very impressed with her helpful suggestion about how to make a buttermilk substitute, by adding lemon juice to ordinary milk. 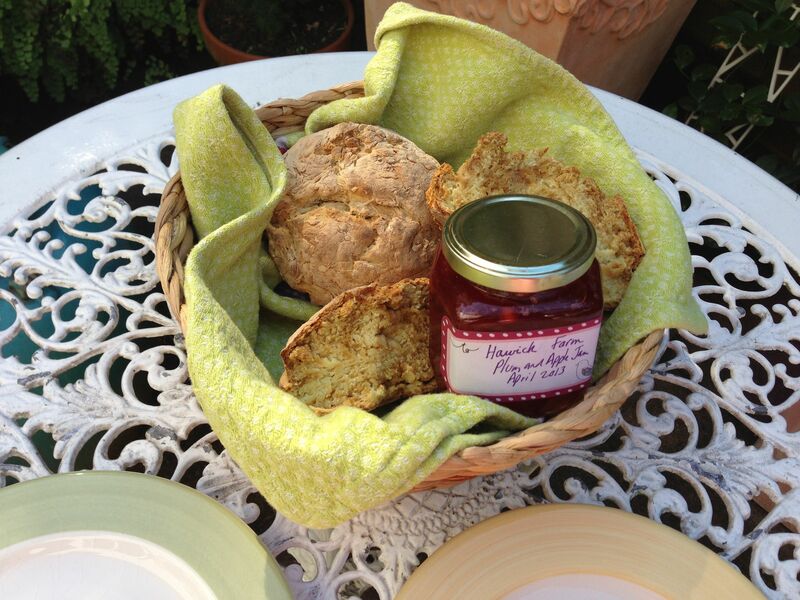 I also liked that she added rhubarb to the traditional soda bread recipe. So I decided to make muffins, using the main ingredients for soda bread – flour, bi-carb and lemon juice soured milk as the buttermilk substitute. I added an egg, as muffin recipes really need that enrichment. My recipe has both fresh fruit and dried fruit. I think both are good – I suggest you go with whatever is seasonal for the fresh fruit, and any fried fruit would work well. These muffins have no butter or oil, so are quite healthy. You could cut right down on the sugar if you really wanted a super-good-for-you muffin. The result was moist, full of gorgeous spices and delicious on its own. A little yoghurt with the muffin would be nice, or even butter…! Preheat oven to 170 degrees C or 160 degrees C fan forced. Line 6 silicon muffin moulds with muffin papers. If you don’t have these moulds, use an ordinary 6 hole muffin tin. Or you can use a smaller 12 cup muffin tin for daintier muffins. Pour the milk into a jug or a cup and squeeze in the lemon juice. Leave to stand for a minute or two to allow the milk to curdle. Add the beaten egg. In a large bowl, combine the flour and bicarb and briefly mix through. Add the chopped plums, with the dried cranberries. Stir in the sugar and spices. Make a well in the centre of the flour/fruit ingredients and pour in the curdled milk, lemon and egg mixture. Stir together, remembering not to overmix as muffins definitely need only rough mixing. Spoon the mixture into muffin cases in your moulds or tin. Just before putting into the oven, sprinkle the tops of the muffins with demerara sugar for added crunch. Bake for 15-20 minutes or until a skewer inserted in the centre of the muffin comes out clean. Serve warm on their own or with yogurt or butter. Posted in Bread, Breakfast, Muffins, Small Baked Things, Sweet Food and tagged buttermilk, cinnamon, crannberries, dried fruit, ginger, Irish soda bread, Jack Monroe, nutmeg, plums. Bookmark the permalink. 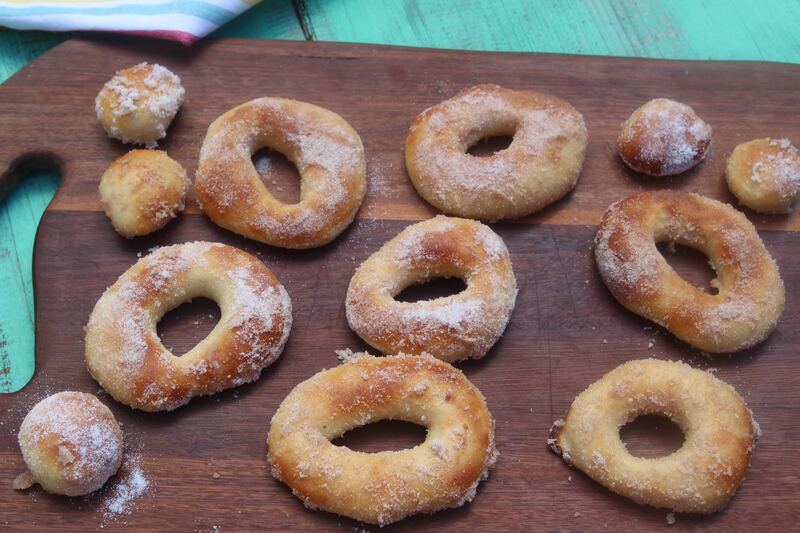 I love the idea of these doughnuts because they are baked, not deep fried. I made them for Easter this year, as a change from hot cross buns. The recipe is from delicious. magazine, April 2015. The baked doughnuts are dipped in cinnamon sugar and then in a rich chocolate sauce. I think I preferred them just sugar dipped – that was sweet enough for me. They end up more like a sweet bun than a traditional doughnut – there’s nothing wrong with that, so long as you are hanging out for that “doughnut” taste. Combine yeast and warm milk with a pinch of sugar in a bowl. Set aside for 10 minutes or until frothy. 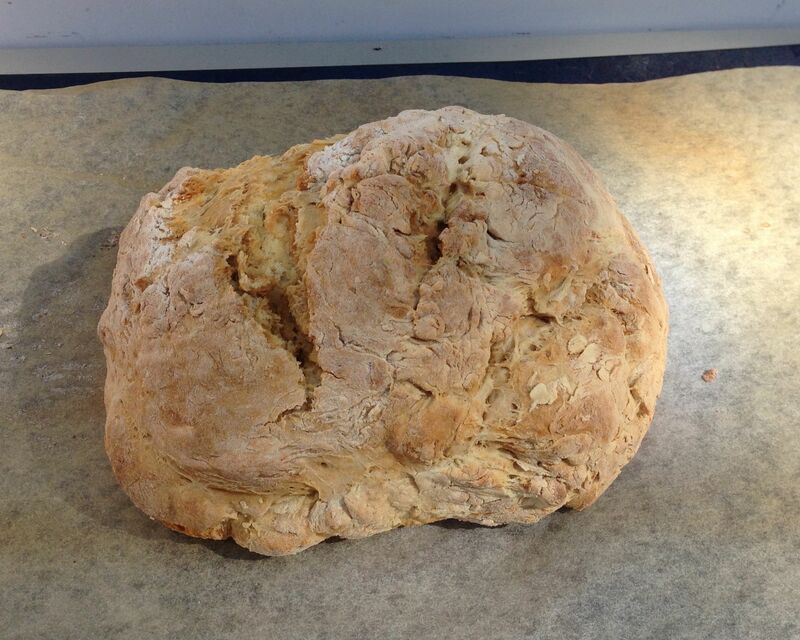 Combine the flour and remaining sugar with a pinch of salt in the bowl of an electric mixer fitted with a dough hook. Gradually add the yeast mixture, buttermilk, egg and butter, and knead on low speed for 5 minutes or until smooth and elastic. Place dough in an oiled bowl, cover with plastic wrap and set aside in a warm place for 1 to 1 1/2 hours until doubled in size. Turn the dough onto a floured surface and knock down. Roll into a sausage and cut into 10 equal pieces. Roll each piece into a smooth ball. Divide between 2 baking trays lined with baking paper. Lightly flatten each ball into disc. Using a round cutter, cut out the centre of each ball. You can bake the centres as “additional” doughnut balls on the trays as well. Cover the baking trays with cling film and set aside in a warm place for a further 1 hour or until risen. Preheat the oven to 200 degrees C. Bake the doughnuts one tray at a time for 8-9 minutes or until light golden. Remove from the oven and move to a wire rack to cool slightly. For the glaze, combine milk, chocolate and sugar in heatproof bowl over a pan of simmering water (don’t let the bowl touch the water). Stir until melted and combined. remove from heat and cool slightly. Brush doughnuts with the extra milk. 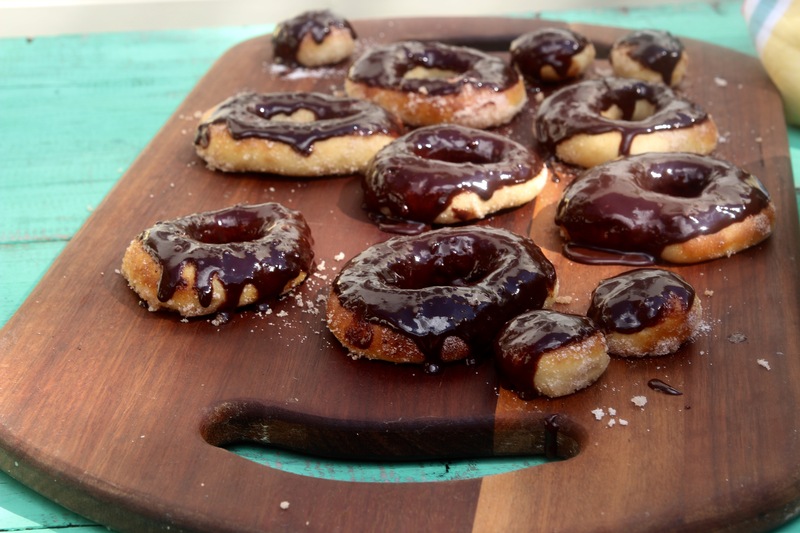 Toss the doughnuts in the sugar mixture, then dip the tops in the chocolate glaze. Posted in Breakfast, Small Baked Things, Sweet Food and tagged buttermilk, chocolate glaze, cinnamon sugar. Bookmark the permalink.